Ok, so you have the software downloaded and you're ready to set it up. For the initial setup I'll just use 1 image to make sure we have the correct software and we'll assume we can get the basics done without much imagery. I'll attempt to list things in steps so that if questions are asked they can be referred to by a step number. O.K. 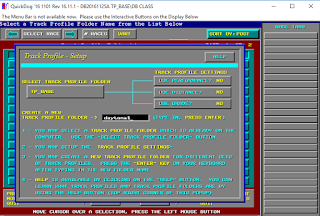 here's what the software should look like after a little tweaking. Don't worry if you don't see this screen yet. 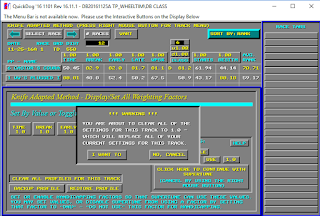 1) The first thing that we'll do when setting up the software is to answer a series of "Interview" questions that are designed to configure certain details of how you'd like to handicap races. We're going to keep this simple by answering all questions with "Auto" There are 12 questions that need to be answered and the software will guide you through it upon initial setup. 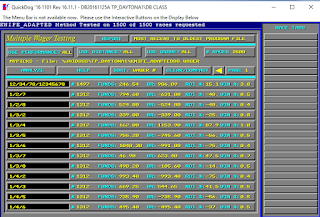 2) The Next thing we're going to need to do is download "Historical Data" for "Daytona Beach" Racetrack. Let's download 6 months worth and call it good. You should be able to find that tab as it's very prominent and a part of the initial setup process. 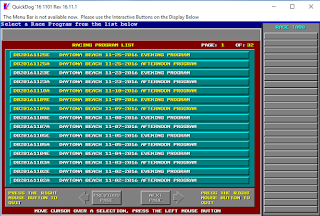 3) Once we have the "Historical Data" downloaded we're going to need to download "Recent Programs and Charts" The first time through you're going to need to highlight and select "Daytona Beach" as the track you wish to get the recent info from. The tab text will turn yellow indicating it's turned on. 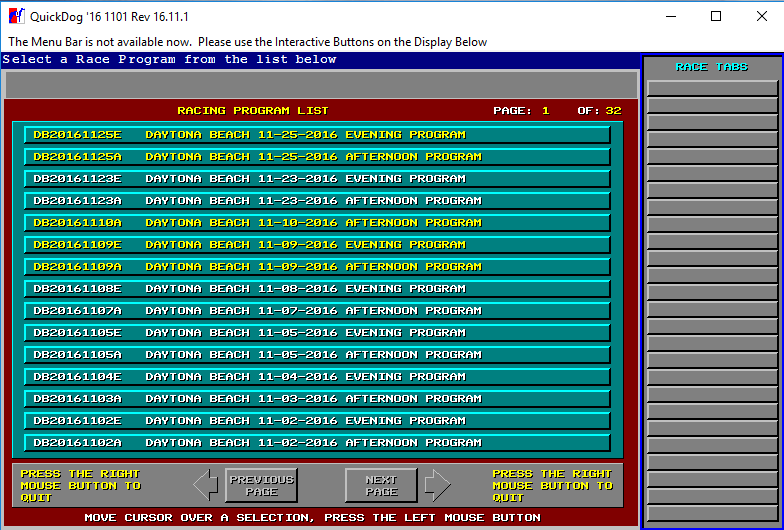 4) Hit the "Continue" button after Daytona Beach racetrack is selected. 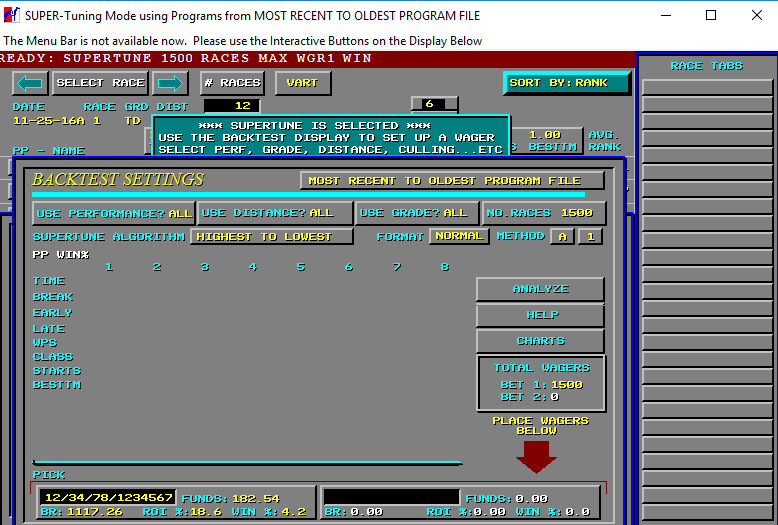 Now you will be asked how many programs back and how many programs forward you'd like to download. Since we just downloaded the historical data we are very up to date. We should just select 2 and 2 for these selections. I always like to overdue it by one just to make sure there are no gaps in my data. You will understand this the more you use the software. 5) You might have to wait a little bit (a minute or 2) for this step to complete and you will see a lot of boxes popup. Just ignore them until it's complete. When it's all done we are ready to go. Hit the "Handicap Now With QuickDog" tab and you'll see the following screen. 6) Click on "Daytona Beach" from the image above. 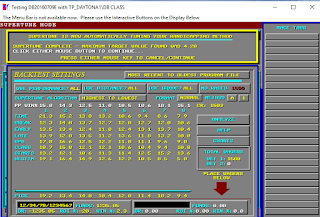 Your software copy should only have the Daytona selection as you only downloaded Daytona's historical information. 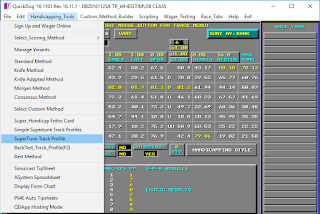 The same process can be applied to each individual track that you want to handicap. 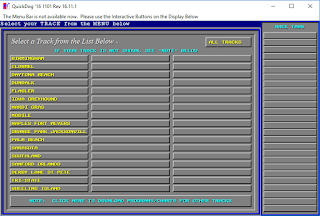 As you can see, I have done that for all the Tracks listed in the bars. We however are sticking with just "Daytona Beach" for now. 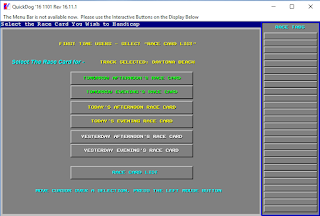 7) Select "Race Card List" from above image. It's at the very bottom of the screen. 8) Select the very next race scheduled to run!! For me it's the afternoon program on 11/25/2016. Tracks highlighted in yellow mean their results haven't been added to the database yet. 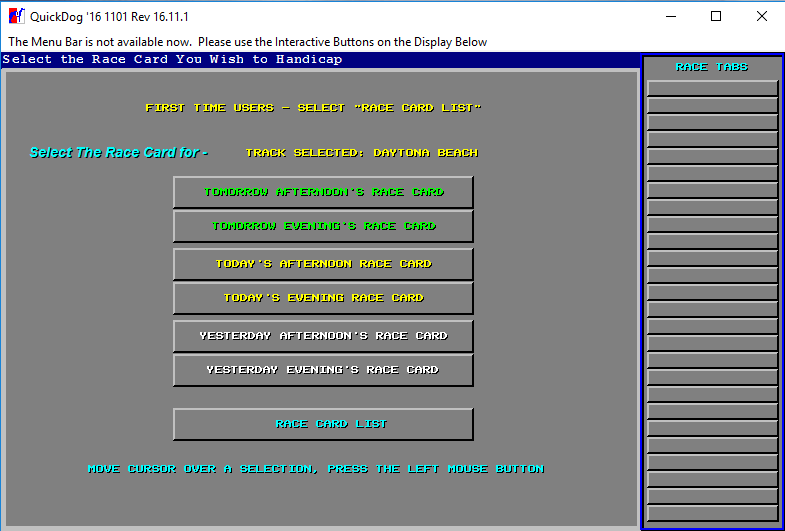 You may notice that some older races haven't been processed yet in my software. That's O.K. for our purposes, but if you wanted to get those results you would need to close and reopen the software, then navigate to step 4 and select 7 days back for program downloads. You will understand things better the more you play with the software. 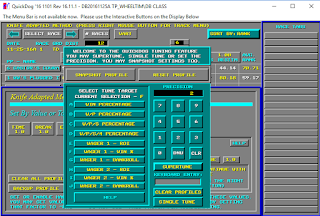 8a) You will be taken to the next screen which will look like the above. Then we will want to click on "File" and then "Set Track Profile Folders" from the drop down menu. 8b) The next screen will look like this. We want to create a "Track Profile" for Daytona Beach so that we can save that Tracks particular handicapping information within it. We will do this for every individual track. Simply type in a name for Daytona Beach. It can be anything you want but obviously should indicate that it's Daytona Beach. 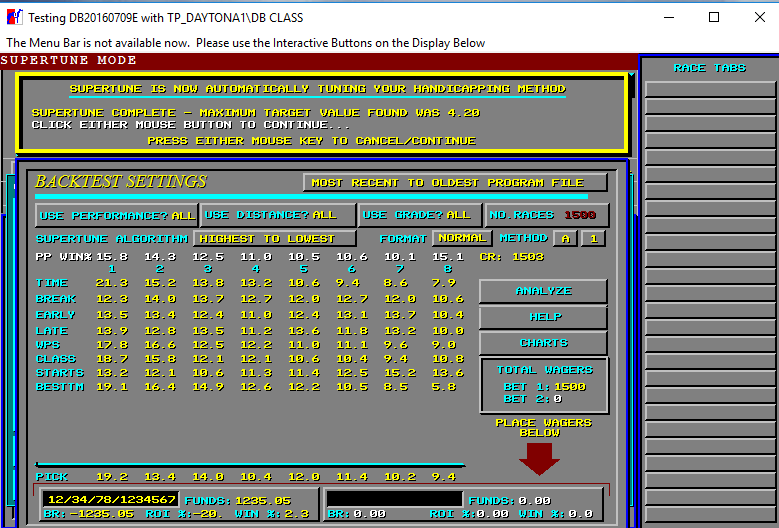 I have typed in "daytona1". Then click enter and "right click" to go back to previous screen. 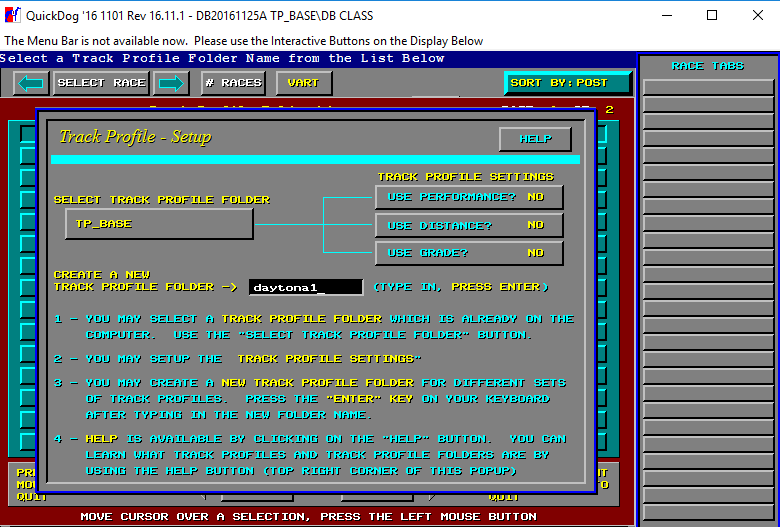 Another note: To choose different profiles or to create new ones you must go back to the screen shown in 8b. 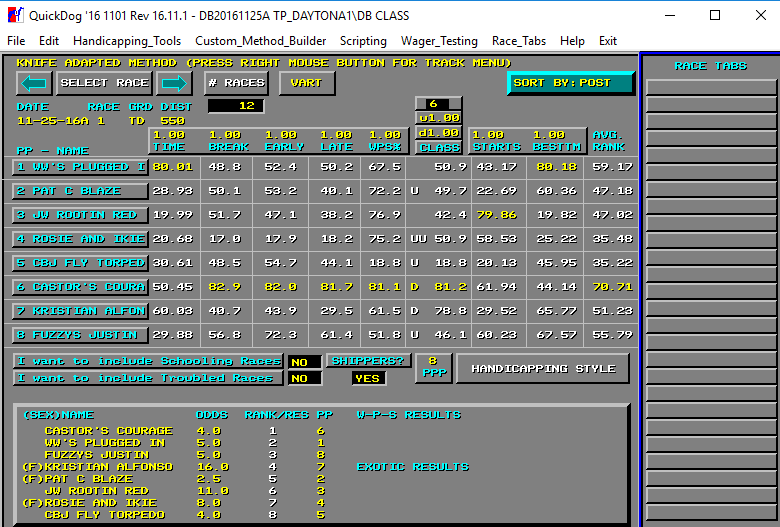 Left clicking the box that should now say TP_Daytona1 will bring up all of the different profiles that exist. As you create more you will be able to select them here. 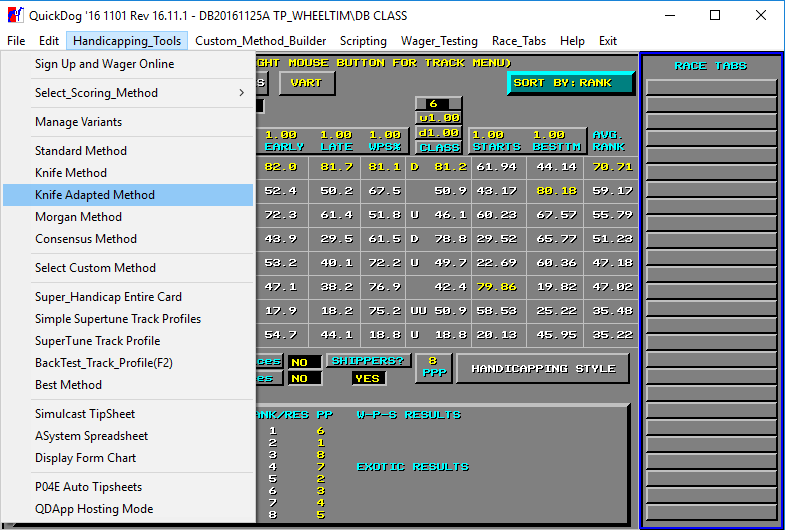 9a) Now Select "Handicapping Tools" then "Knife Adapted Method" from the drop down. 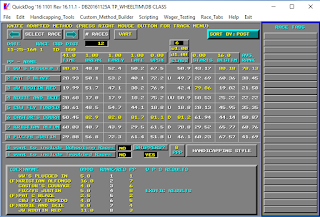 We are selecting this style of handicapping for it's speed of use. The Morgan Method is the most complete and accurate but takes a while to complete. 9b) The Next thing we need to do is set how we list our dogs. By default the dogs are simply listed by their "Post" number. This is no good and we need to change that. This is done by clicking the button that says "Post" in the top right corner. 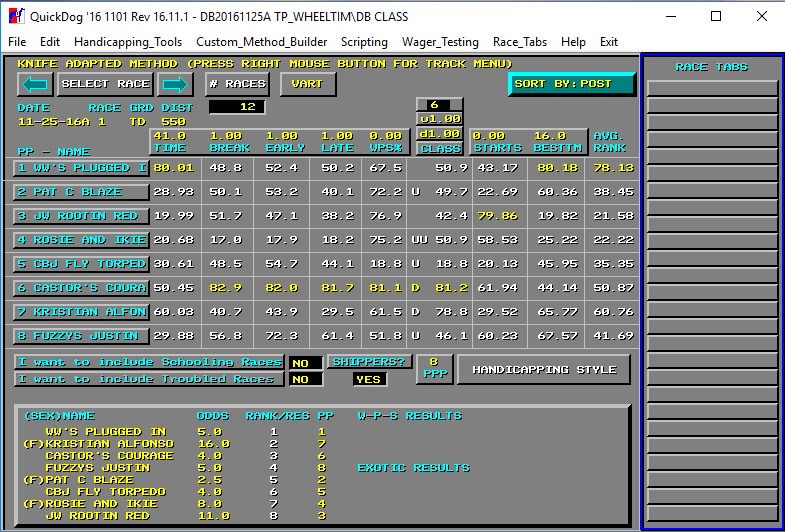 10) Select "Handicapping Tools" from top left then select "SuperTune Track Profile" from drop down menu. 11) Click "Clear All Profiles For This Track" then click "I Want To" on the popup. 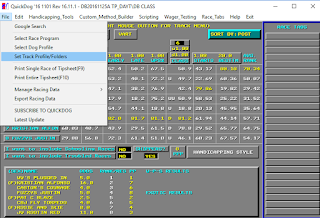 We are just clearing any previous handicapping data that might be stored in our settings. You should see all values go to 1 after this is done. 12) Click "Continue Here With SuperTune" to bring up the blue popup menu which you will set with the value of "2" for precision and "F" for wager 1 - win percentage. 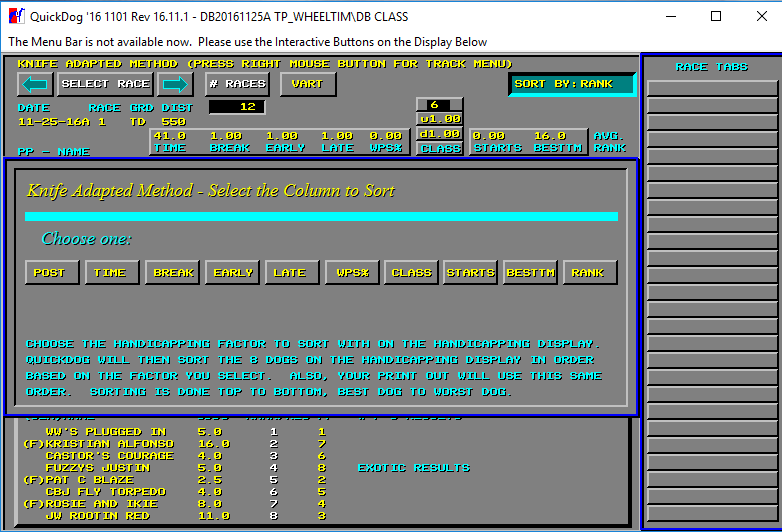 Once those settings are set Click SuperTune. 13) After clicking you should see this screen. 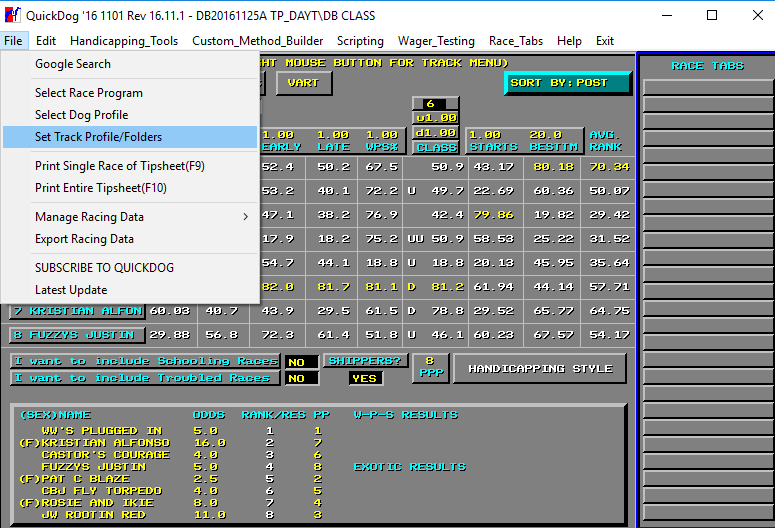 You will need to set your screen variables exactly like I have mine. Use Performance All....Use Distance All.....Use Grade All....No. 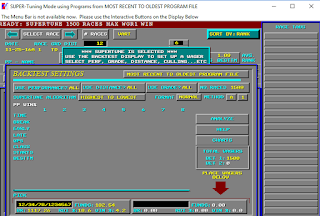 Races 1,500.....Most Recent to Oldest Program File...SuperTune Algorithm Highest to Lowest....Format Normal...Method A1. Then go down to your pick box and set it up like I have mine again. 12/34/78/All ***all numbers are rankings and not numbers of dogs*** for a 10 cent Superfecta. The bet will total $4.00. When done hit "Analyze". 14) When done the Screen will look like this with the top lines being yellow. 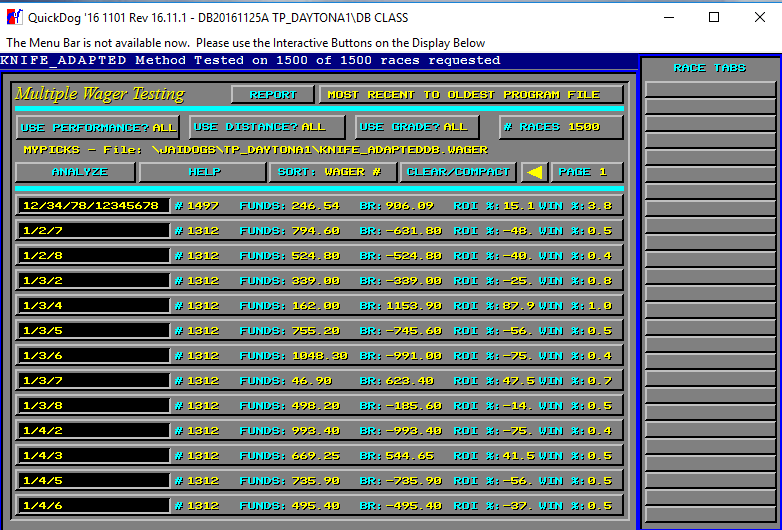 Right Click and you are handicapped for Daytona Beach!! 15) It's time to run a simulation on our handicapping technique to see how it's done over a particular period of time. 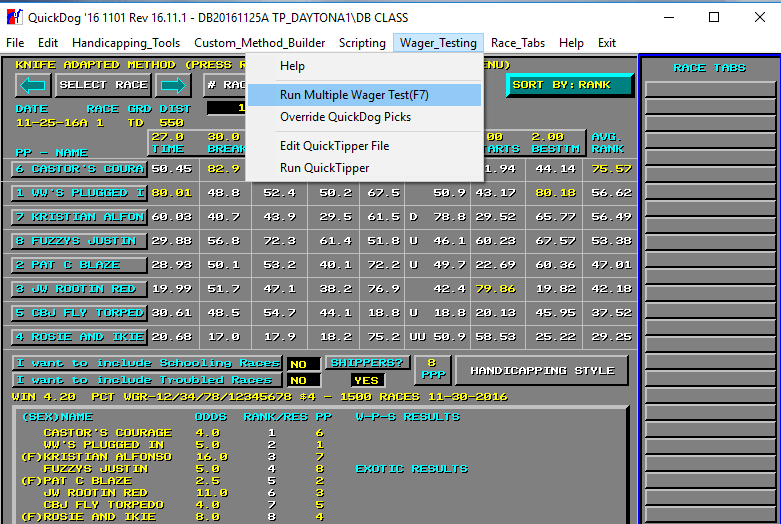 Select "Wager Testing" and then "Run Multiple Wager Test" to go to next screen. 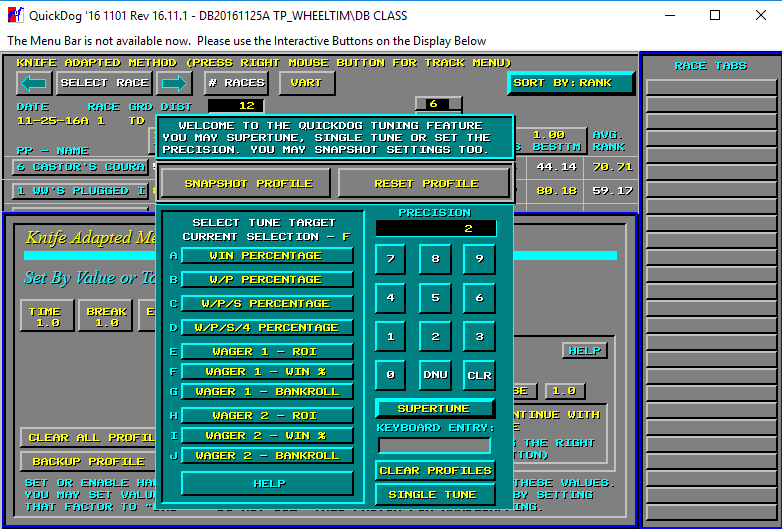 16) On this screen set all the settings like I have once again. That is All...All...All...1,500...Most Recent to Oldest Program File...Wager#. Set the Wager to 12/34/78/All. This is a 10 cent base superfecta totaling $4.00. 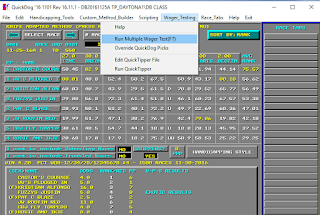 Hit Analyze and the software will show you how your handicapping system did over the last 1,500 races. As you can see had you played the combo of 12/34/78/All over the last 1,497 races you would have profited a total of $906.09. The BR stands for BankRoll. You would have needed funds of $246.54 to accomplish this and you would have won 3.8% of your wagers. Your overall Return On Investment would have been 15.1%. The overall results of this particular example are really quite modest. I have run a handicapping test where I've seen upwards of 70% ROI!! 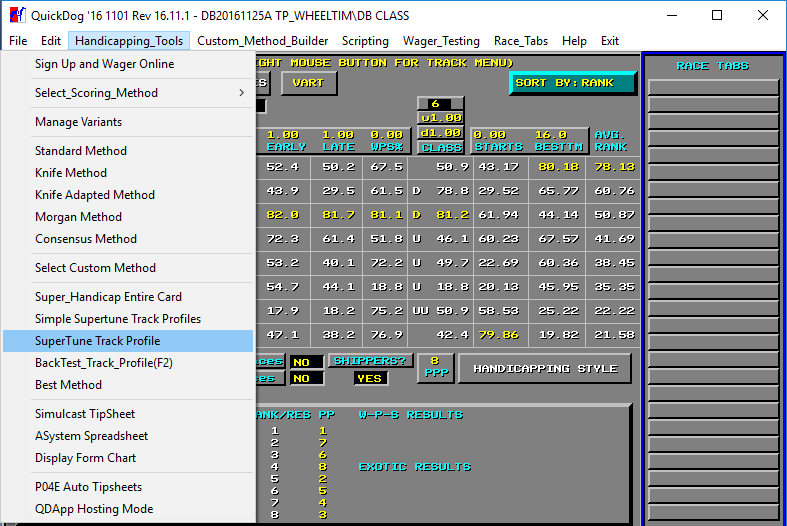 This was just thrown together quite quickly to get you started with the software. As you play around with it you will see it's potential. 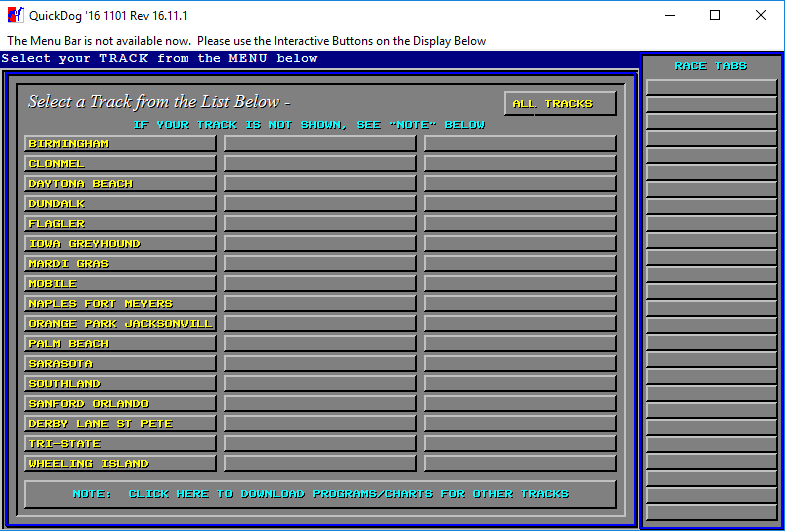 You may have noticed that my wager boxes were full on image 16 with combos like 1/2/7 and 1/2/8. I manually added every single trifecta combination to those boxes. I did this so that when I finish a handicapping test, I can see how combinations other than my main test combo have performed. I highly suggest you do this as well for it will give you "Extra Winning Combinations" that you can play besides your main test combo. For example we know that our main combo of 12/34/78/All profited $906 and won 3.8% of the time. Well, as it turns out the $1 base trifecta 1/34/34 would have profited $1,698 with a 1.5% win percentage and a 64.7% ROI. That is quite nice for a paltry $2 bet. More importantly though is that it gives you a higher strike rate which is important for your mental state of mind. It's hard sometimes to wait around to win a bet when that bet only hits 3.8% of the time. Well, that's it for me and I hope you can understand most of this. This is my very first attempt at teaching this to anyone so forgive me if it's a bit sloppy. If any of you have any questions please, please comment below. 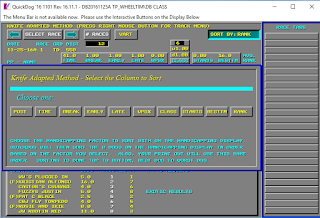 If you've arrived here from somewhere else this guide is in reference to the QuickDog Greyhound Racing Software. For further details about the software and for the 30 day free trial link to the software click the link below.